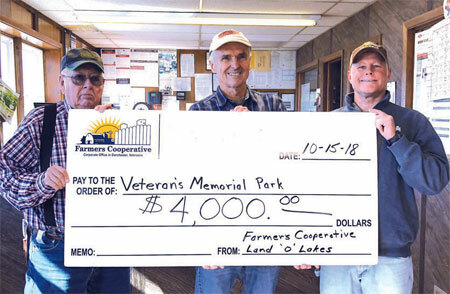 Farmer’s Cooperative recently teamed up with Land O' Lakes to donate $4,000 to the American Freedom Defenders Veterans Memorial project. The memorial, which is planned just off U.S. Highway 6 at 405 9th Avenue in Fairmont, will honor all veterans across the nation, from long ago to now, in peace and war time, for the profound sacrifices they and their families have made. The eternal flame, flag poles, statues, trees, gazebo, fountain and additional displays will make a beautiful foundation for people to show their humble respect. Farmer’s Cooperative is proud to be involved in such a worthy cause. Farmer's Cooperative officials were on hand in Fairmont last Monday for a check presentation. "We very much appreciate this," committee member Howard Lefler said last week at the check presentation. Lefler noted that construction has started on the local veterans memorial project with concrete sidewalks being poured and electricity being roughed in. He also said more than $50,000 has already been raised to make the project a reality. For donation information, stop by Heartland Bank in Fairmont or call 402-268-2361 (Cindy Slocum). Tax-deductible donations can also be mailed to American Freedom Defenders Veterans Memorial Tribute, PO Box 174, Fairmont, NE 68354. Another contact is Mary Lundberg, 402-366-2916. The committee is raising between $225,000 to $250,000 to complete the project.